A shock-expansion tube/tunnel is a ground-based test facility to generate hypervelocity test flows for the study of atmospheric reentry physics. Such a high enthalpy test flow features thermochemically non-equilibrium which may lead to critical difficulties in flow diagnostics and measurements. In addition, the test time of such an impulse facility is extremely short which implies a requirement of transducers with high-frequency response capability for model tests or flow diagnostics. In the present work, computations for non-equilibrium reacting flow are conducted to diagnose the key flow parameters and evaluate the test flow for facility upgrading. A conic nozzle is appended to the original facility and to obtain a larger test section and larger Mach numbers. 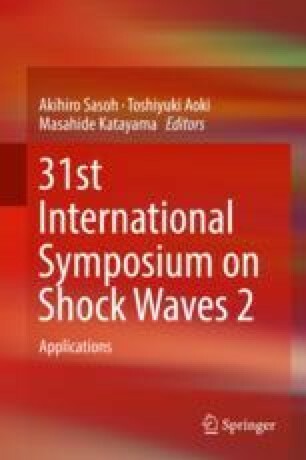 Further experiments are conducted to visualize the overall flow structures over the test models by self-illumination of radicals at high-energy states post strong shock waves. The heat flux at the stagnation point is measured with specially designed thermal couples. This work was supported by the National Natural Science Foundation of China under Grant No. 11672308 and 11532014.